Smartphones like BlackBerries and iPhones aren’t just for yuppies, corporate suits, and early adopter-types anymore. But the majority of people in the U.S. still own feature phones — the “dumb” phones that are primarily used to phone calls and do text messaging. That will change in the next year and a half, Nielsen predicts. 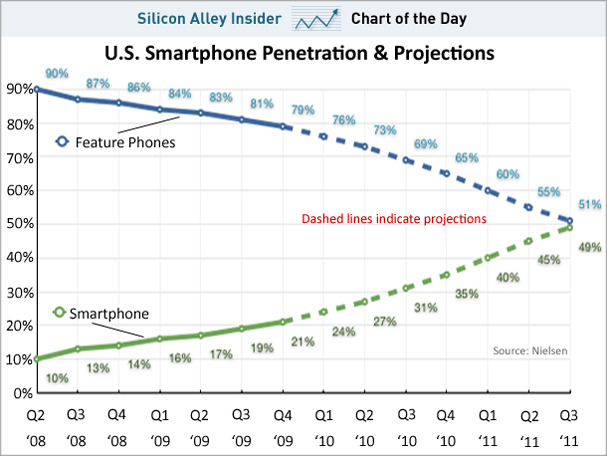 According to the company, 49% of mobile phone owners in the U.S. will have smartphones by Q3 2011, up from 21% now. As a result, the next year and a half is a critical land grab for the smartphone market. Apple, Research In Motion, Google, Microsoft, Nokia, and Palm are all duking it out to capture share. While RIM and Apple are in the lead today, this chart shows there is plenty of room for growth.